Published: Jan. 10, 2014 at 06:03 p.m. Updated: Jan. 10, 2014 at 10:33 p.m.
Could Kyle Shanahan get another chance to work with a high-profile quarterback from the 2012 NFL Draft? The Dolphins announced Friday that the former Washington Redskins offensive coordinator interviewed for Miami's offensive coordinator position Friday. Philadelphia Eagles quarterbacks coach Bill Lazor also interviewed for the job. 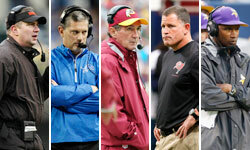 Shanahan was among the staff let go after Shanahan's father, Mike, was dismissed by Redskins owner Daniel Snyder last week. NFL Media Insider Ian Rapoport reported last month that Shanahan decided he can no longer work with his father. If Shanahan lands the Dolphins job, he'd work with quarterback Ryan Tannehill, the No. 8 overall pick in the 2012 draft. Griffin was the second overall pick that year. Lazor's stock has been helped by Eagles quarterback Nick Foles, who emerged as a star after taking over for an injured Michael Vick this season. Prior to joining Chip Kelly's staff, Lazor spent three seasons as the offensive coordinator and quarterbacks coach at the University of Virginia. Dolphins owner Stephen Ross announced in a statement Thursday that coach Joe Philbin was in the process of conducting interviews for the offensive coordinator position. Mike Sherman was fired Monday after two seasons with the team.